Create a statement using this eye catching light fitting. Using many elements and textures has ensured a truly unique light. The voluptuous base encompasses a snake skin inspired pattern that is then complimented by a brown oval shade. 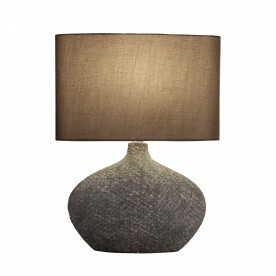 This chic table lamp would be ideal for placement in a modern living room.